Nationwide, the average graduation rate for black students at 676 traditional public and private nonprofit institutions is 45 percent — 19 points lower than the 65 percent graduation rate for white students. While the University of North Carolina at Greensboro graduates just as high a proportion of its black students as its white students, it's a rare exception among institutions. Much more common is a "black-white completion gap." In contrast, Youngstown State University in Ohio graduates white students at a rate almost five times the rate of black students. A new report from the Education Trust suggested that a multi-pronged approach is the only way to eliminate the gap. The trust is a national non-profit advocacy organization that promotes high academic achievement for students, particularly those of color and those with low-income backgrounds. 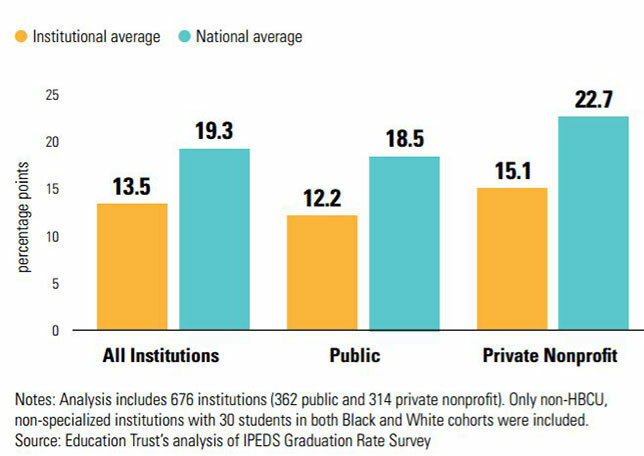 In its new report, "Black Student Success: Identifying Top- and Bottom-Performing Institutions," the trust highlights those institutions that are doing a "good job" of serving their black students all the way through college completion and those who don't. "Black Student Success: Identifying Top- and Bottom-Performing Institutions," by the Education Trust. The report offers stark comparisons. Virginia's George Mason University and the University of Kansas, as one example, have much in common. "Both are fairly selective research institutions with admissions test scores near the top quartile of institutions," the report stated. "In addition, the two institutions enroll similar percentages of freshmen receiving federal Pell Grant dollars — a proxy for low-income status." They have similar numbers of undergraduates (about 20,000). However, the percentage of black freshmen at George Mason is slightly more than twice that at U Kansas. And another difference is this: The six-year completion rate for black students at U Kansas is 45.3 percent; at George Mason it's 65.9 percent. Yet, among black and white students attending the same institution, the average gap is only 13.5 percentage points. Why the difference? As the report explained, the national gap is more than just the "accumulation of all of the individual graduation rate gaps between black and white students." The remainder comes from "differential enrollment patterns." Removing the gaps at each campus would add an additional 12,000 black graduates, lowering the national gap from 19 points to seven points. The divergent enrollment patterns are generated by too few black students attending "selective institutions," which "typically have higher graduation rates," the report noted. "Far too many" black students end up in "the least selective institutions where few students complete in six years." To eliminate that lingering seven-point gap, Education Trust said, would require additional work beyond individual schools addressing their own inequities. First, selective colleges and universities need to enroll more black students. And, second, the institutions where black students are more likely to attend need to improve their rates of completion. A graduation cohort of at least 100 black students and 100 white students. Georgia State leads the ranking, with a gap between black and white students of minus-six points; that means the university graduates more black students proportionally than white students. The school at the top of the list here is Michigan's Wayne State, with a completion gap of 33 percentage points. The report also calls out four-year, for-profit schools, which undertake the education of almost 17 percent of all black undergraduates and 8 percent of black first-time, full-time students. Compared to public and private nonprofit institutions, these colleges do "far worse." They graduate just under 19 percent of their black students in six years, compared to 41 percent of public institutions and 45 percent of private nonprofits. The graduation gap is also alarming at for-profits; they graduate white students at a rate nearly two times higher than black students. "Where black students do and don't enroll is key," said Andrew Nichols, the trust's director of higher education research and data analytics and lead author of the report, in a prepared statement. "To completely eradicate the completion gap, more black students must graduate at institutions that have poor track records in student success, and institutional leaders at selective institutions need to enroll more black students. Data show over and over again that capable black students often enroll in colleges beneath their academic levels. This practice of 'undermatching' needs to stop." The 16-page report is freely available on the Ed Trust website here.